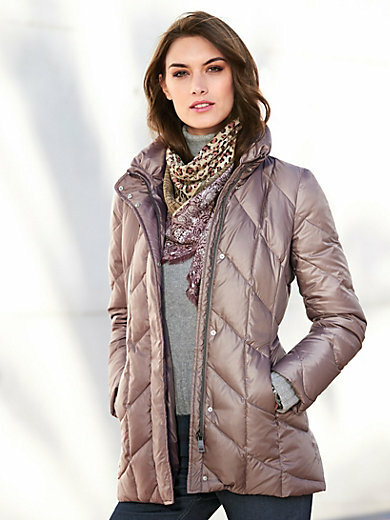 Quilted down jacket by FUCHS & SCHMITT: pleasantly warm, feather-light and chic, made of soft microfibre with a filling of 80% eiderdown, 20% feathers. Clever top-stitching in the front and back has a figure-smoothing effect and ensures a slender silhouette. With raised collar, zip and a concealed row of press studs. With 2 zipped seam pockets and a zipped inside pocket. 100% nylon. Lining in 100% polyester. Length approx. 30ins. The down jacket is machine washable.